The six count charges dropped against our director Nnamdi Kanu and others arraigned at the federal high court Abuja display a foretaste of what is to come. The prosecution will definitely be proved illegal and unnecessary in due cause. How could an innocent man who never plotted coup against any government be slammed with treason or treasonable felony? What has radio broadcasting got to do with political assimilations and possession of arms? When did enlightenment of a people through radio become blasphemy to leadership? 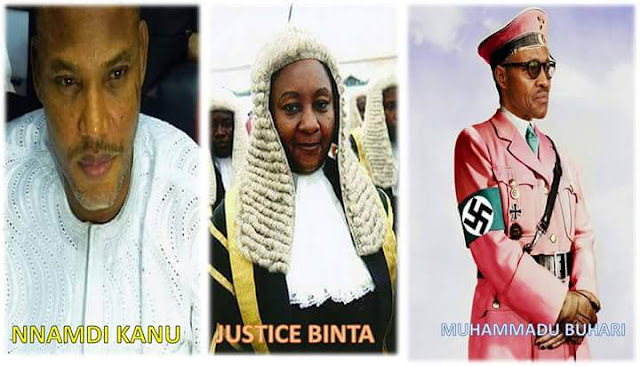 The misplacement and misuse of power and authority has been so evident in the unlawful detention of Mazi Nnamdi Kanu such that the courts of law have violated the rule of law by their refusal to release an already acquitted man since December, 2015. The previous (In) Justice John Tsoho played an unforgettable charade and blatant violation of human rights and deviation from course of the law. He dangled unethical review from display of masquerade to secret trial, then shamefully retired from the case when it was evident he had overused his excuses and tactics. Here now is a change of game play; with the Nigerian president on transit to an unknown destination, the tables have turned and we see the erstwhile Justice Binta Nyako, reconsidering her former vindictive style and coming all out to visibly strike out six out of the eleven illegal charges levied against our Director and other brethren. This is a good development but our expectations are more and higher than this. It is a positive turn of events but we have lingered enough in this Nigerian chimney productions. Smokes have been definitely produced without fire, as lack of evidences and exhibits grease the prosecutor's efforts constantly. Our expectations remain; total freedom for our leader Nnamdi Kanu and all abducted, arrested and unlawfully detained Biafrans all over the Nigerian states and prisons. We also expect that the remaining unproved and unnecessary allegations be struck out as well, because there are no reasons for delaying the first and second initial verdicts anymore. The prosecutor has been unable to make powerful case or truthful presentation so far, he has been stumbling like an already blind man in darkness groping for help from masked witnesses and seeking secret trial of one that has been openly accused and condemned by the Nigerian president in public. Our expectation and resolve remain total liberation of Biafra from an expired country which has under-rated us all these years. We have been malnourished in the midst of plenty, our lands have suffered immense dehydration due to regular milking of our resources and facilities with out refurbishment and recompense. We lack essential fundamental amenities. No good roads, no structural or governmental erections of worth, just to mention a few. We want absolute freedom from tyranny, suppression and oppression! These are our expectations, and that the Nigerian government should apologize to Biafrans for unduly making her suffer, killing her citizens without relent, lying shamelessly on social media about our leader coming into Nigeria without a passport amongst other things. We expect recompensation for the maimed, those whose homes were demolished for hosting IPOB family meetings, many who lost their jobs and means of livelihood by been abducted and detained. IPOB is certified legal, therefore, her dignity needs to be restored. I look forward to seeing the Nigerian government do what is right by granting us what rightfully belongs to us. All hail Biafra! Free Nnamdi Kanu! Let Biafra go!